Gradually, Airtel 4G LTE is expanding to other states and very soon, it will cover the 36 states. Now you experience what it’s like to download 1.GB files in seconds with Airtel 4G services. 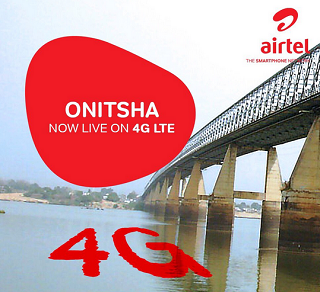 The Airtel 4G LTE network supports Band 3 (1800MHz) which almost all mobile devices are using. So if you are living in Anambra, go and do sim swap to enjoy free 4GB Airtel data. Patiently waiting for them here in my state. Yes o, am enjoying Airtel 4G now in Nnewi. There are the only 4G networks available here for now. Good One. I wishit could get to Imo as Asap.